The company said it plans to create 20,000 new jobs as well. 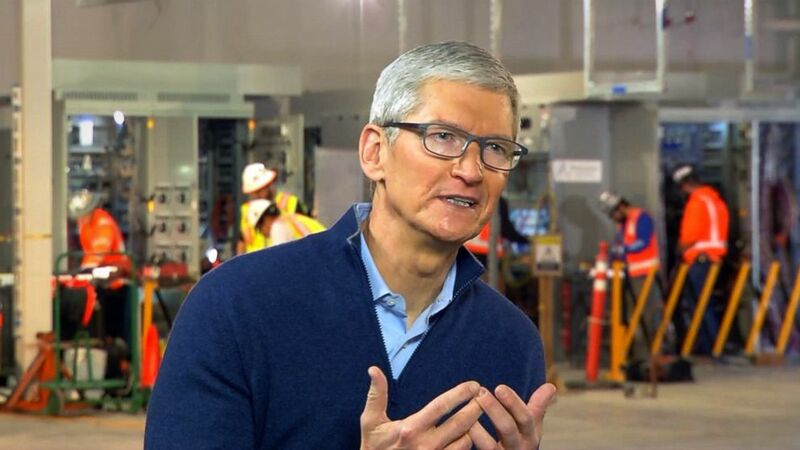 Apple CEO Tim Cook opened up to ABC News after the company announced earlier today that it will be investing $350 billion in the U.S. economy over the next five years, creating more than 20,000 jobs. In a news release, the company also said it would make a $38 billion tax payment to the U.S. as required by recent changes to the tax law. Apple said this would be the largest tax payment of its kind. While Cook would not "take a position" on how the new tax plan is affecting individuals' taxes, he said $38 billion tax payment would not have been paid under the old system. "I hope -- I have that faith -- that it will be used for great purpose for the country, whether that's infrastructure or education, or what have you, that will further supply jobs in the U.S." in the short term, Cook told ABC News chief business, technology and economics correspondent Rebecca Jarvis today. Apple officials have "always viewed" that the company could only have been started in America and that they feel a responsibility "to give back," Cook said. "One of the ways to do that is to create jobs," he said. 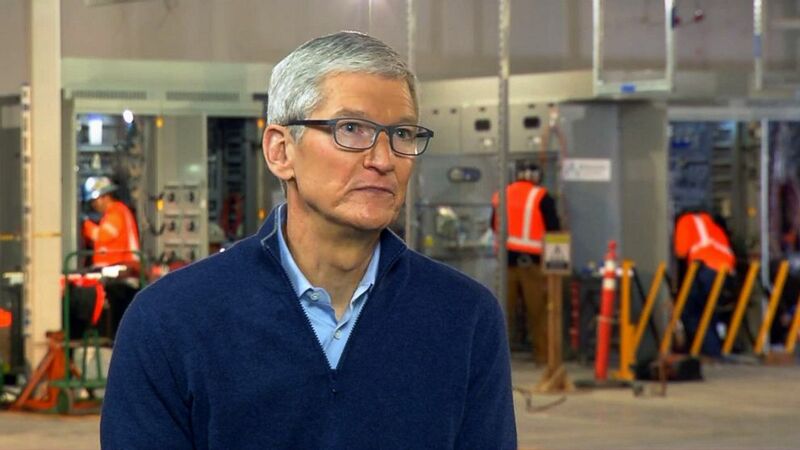 (ABC News) Apple CEO Tim Cook is interviewed by ABC News in Reno, Nev., Jan. 17, 2018. When asked about the biggest skills missing in job candidates today, Cook said that there is a “huge shortage” of computer and software programmers. "Demand is far outstripping the supply of workers," he said. "It’s an area where there’s been a disconnect between the workforces being trained in education and the need by companies." In addition to the stock repayment, Apple will be giving almost all of its employees a $2,500 stock grant, Cook said, calling them the “soul” and “most important” assets of the company for their role in creating its products. "We’re one of the few -- we’re probably the only company of our size where every person is an owner in the company," Cook said. "… Instead of a onetime kind of bonus, we wanted to do something that lasts a longer period of time." Apple will also be matching employees’ charitable donations two-to-one, Cook said, adding that he has received lots of emails from "employees who are very happy" since the announcement was made Wednesday morning. Apple said today it would focus on three areas: direct employment by Apple; spending and investment with its domestic suppliers and manufacturers; and fueling the fast-growing app economy that it's created with the iPhone and its App Store. "We believe deeply in the power of American ingenuity, and we are focusing our investments in areas where we can have a direct impact on job creation and job preparedness. We have a deep sense of responsibility to give back to our country and the people who help make our success possible," Cook said in a press release. Cook said the "educational component" in creating jobs is "huge." Apple has provided a curriculum for kindergarten through 12th grades on using Swift, the programming language developed by the company. It has also invested in community colleges and creating a tutorial for Apple users to learn how to code at its stores. "It's a place where people go in and hopefully they come out with a little spring in their step," he said. "They know something they didn't know before. ... That's what we aspire to." Last month, Apple reduced the price of out-of-warranty batteries for certain iPhones from $79 to $29 after it was scrutinized for allegedly slowing down processors in older phones. "Maybe we weren’t clear," he said. "We deeply apologize for anyone who thinks we have some other kind of motivation." Cook the focus was on the “user experience,” and the code was released to prevent the probability of an unexpected restart while using the phone. When asked about the possibility of a cheaper iPhone, Cook said that he believes the phone as priced "at a level that is consistent with the value of the phone." "We put a lot of innovation in these phones, and so we think they’re a reasonable price," he said. Amid today's news, the company also broke ground on a new site in Reno, Nevada. The new site is an expansion of a smaller data center that was started in 2012, Cook said. The total investment on the 1,700-acre Reno property will be about $2.6 billion and includes the cost of solar farms that will allow the data center to run on 100 percent renewable energy. Cook said it has been a "long-felt" desire and objective for Apple to run on 100 percent renewable energy. "When you look at the beautiful land here [in Nevada], it's incredible," Cook said. "We want to do everything we can do to keep it that way." The Nevada location is "open for business," Cook said, adding that "it feels great to make that kind of difference" in bringing economic activity to the area. Up to 500 people, including electricians, plumbers, and contractors, were working at the site on Wednesday when Cook allowed ABC News a sneak peek of the new data center. "You know, there's nothing like jobs to give people a sense of purpose," he said. The center is where FaceTime calls are initiated and where data stored in iCloud like iMessages and photos are located, Cook said. "It's here," he said. "And we couldn't provide the service that we could provide without it." Cook said that he hopes the data center will open in 2019 and that Apple will be hiring more people as it gets "closer to the ribbon-cutting of the new building." Meanwhile, Apple officials are currently searching for where it will place a third campus, Cook said. Its current campuses are located in California and Texas. The location of the new campus has been narrowed down to prevent a “sort of auction process,” Cook said.